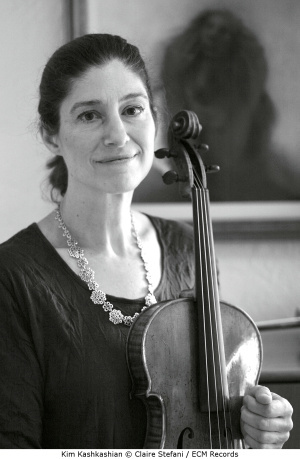 Following Grammy Award nominations for several previous recordings, Kashkashian received a 2012 Grammy Award in the "Best Classical Instrumental Solo" category for Kurtág and Ligeti: Music for Viola. Kashkashian's recording, with Robert Levin, of the Brahms Sonatas won the Edison Prize in 1999. Her June 2000 recording of concertos by Bartók, Eötvös and Kurtág won the 2001 Cannes Classical Award for a premiere recording by soloist with orchestra. She is a founding member of Music for Food, an initiative by musicians to fight hunger in their home communities. Kim Kashkashian has been an ECM recording artist since 1985. Lera Auerbach is a composer, concert pianist, writer, painter and sculptor. She has published more than 100 works for opera, ballet, orchestral and chamber music, and performs as concert pianist throughout the world. Her work is championed by leading artists, conductors, stage directors and choreographers, with recent works staged by the San Francisco Ballet, Stanislavsky Theater, Hamburg Opera, Theatre an der Wein, National Ballet of China, Finnish National Ballet, National Ballet of Canada, Netherlands Dance Theater, Semperoper and Staatskapelle Dresden, and New York’s Lincoln Center. Lera is a regular contributor to the Best American Poetry blog, has published three books of poetry and prose in Russian, and is the author of several librettos. In 2015, Arch St. Press published Excess of Being, a book of aphorisms by Lera Auerbach. Prizes for her works include two Golden Masks and the Hindemith Prize. She holds degrees from the Hanover University of Music, Drama and Media and The Juilliard School, where she received the P. and D. Soros Fellowship. The World Economic Forum in Davos, Switzerland, selected Lera Auerbach in 2007 as a Young Global Leader and in 2014 as a Cultural Leader, where she lectured on borderless creativity, a topic that she also presented at the University of Michigan, Harvard University, the Open Society Institute and other venues. Arcanum is Lera Auerbach’s first recording for ECM New Series. CD booklet includes excerpts from an interview with Kim Kashkashian and Lera Auerbach, and liner notes by Anselm Cybinski, in German and English.